We’ve all had the experience of being a first time guest at a church. Hopefully it was good, but maybe it wasn’t. Just like with any first impression, you should aim to make a good first impression of your church, even in the little things. A good first impression starts with clarity, so make sure you wow your guests with church hospitality that serves visitors. When speaking with a colleague regarding the “first time guest experience,” we agreed on some things that are likely to make visitors feel welcome, yet still allow them to remain a bit incognito as they check out a new church for the first time. When someone first steps on your church property, do they know where to go? Is your church entrance clearly marked? First time guests often come to a church building with NO IDEA where to go. This starts with actually getting into the church, as many first-time guests are uncertain about where the actual entrance to the church is. I recall visiting a church one time and had no idea where the entrance was. It was not apparent nor clearly marked, so I drove around looking for some context clue for where to enter. Finally, I parked and waited to see where some other people were going in. Once I thought I found the right entrance, I realized I may have parked in a place that I shouldn’t have, so I looked around for an acceptable place to park. After all that time, I finally entered the building, but found myself in one of two services going on. I clearly didn’t belong in the service I entered (as it was targeted for young adults)…I had no idea they had two distinctly different services going on at the same time! The issue here was a lack of clarity on where to enter, where to park, and where to find the worship service. If those initial three location issues were more clear to me as a visitor, I would have felt much more comfortable and confident entering the church building. My guess is that many new church-goers wouldn’t have even made it that far and turned around and gone home! How easy is it to get more information about your church? Does your website give plenty of information for someone that is learning about your church? An FAQ section addressing some basic and most common questions can help a new visitor feel better about the church and what to expect when visiting. During Sunday (and/or Saturday services), can individuals find an information kiosk easily? Are greeters, ushers, or staff members easily identifiable? Some churches utilize a certain color of lanyards and name tags; others use shirts to make staff easy to find. Find what works for you and your church culture, in order for your visitors to know where to get information. Children’s ministry is a huge area you want to make sure you have clarity on. Visitors who have children will want to know where to take them for children’s programming. Make sure you clearly let your visitors know where the children will be, if they will be switching rooms for music or other activities, and how the pick-up process goes. Some larger churches have thorough systems for identifying children and their parents, in order to ensure security and order. Let your visitors know the value of this process. Also, prepare them that sometimes the registration process and orientation takes a bit of time. Be accommodating, but don’t let your guest leave feeling frustrated because they were late for the actual church service they came to be a part of. Signage ranks among one of the top facility-related things churches need to improve upon. Your visitors are walking into your building without having seen the property before. They will not naturally know where things are, so be sure that the sanctuary, service times, children’s areas, and restrooms are all well-marked. You want it to be obvious to a visitor coming to your church. When it comes to signage, first and foremost make sure the actual church sign is visible and clear. Can you see the words from a distance? Are they visible at night? Your signs by the street may be the first thing that catches a new visitor’s eye. You want to make sure they know that your church building is an actual church and a welcoming place that they would want to come visit. 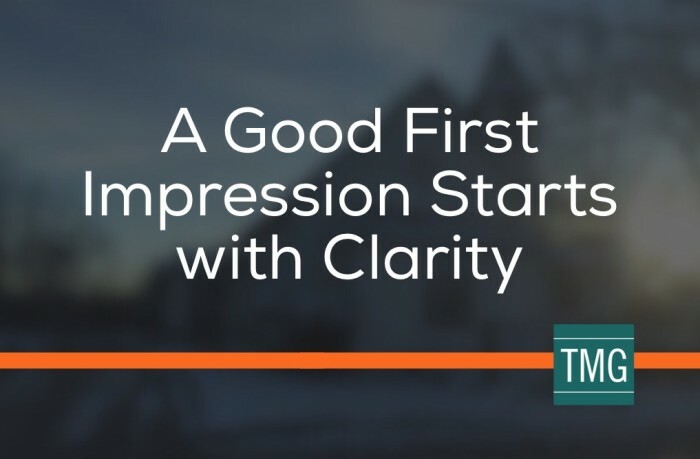 These are just a few suggestions on how a good first impression starts with clarity. Take a good look at your church building and evaluate what areas you can provide more clarity. Not sure where to begin? Consider a First Impressions Evaluation. Ask your first impressions team to put themselves in the guest’s shoes so you can provide visitors with a clear, easy visit that leaves them wanting to come back and worship with you again. Susan Malphurs is the Executive Vice President of the Malphurs Group, an HR, Outreach, Church Leadership consultant, blogger at malphursgroup.com/blog, wife, mother, and grandmother. (@susanmalphurs) When Susan isn’t involved in serving pastors and churches with the Malphurs Group church consulting firm, she enjoys reading, exploring the “foodie” options in Dallas, TX, and doing anything that involves her grandchildren.